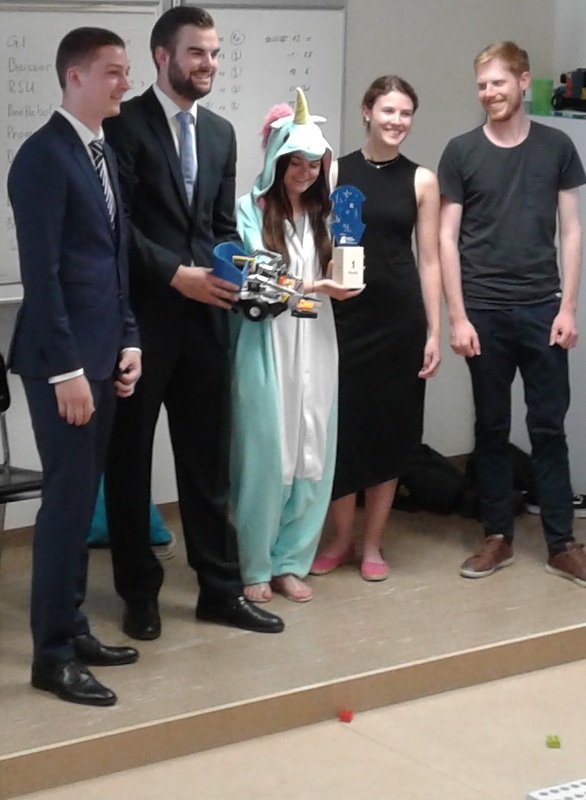 After our first week in Switzerland, we experienced an exciting robot competition at the Institute for Mechatronic Systems. Our May term seminar is hosted by the Institute for Mechatronic Systems, a division of the school of engineering at ZHAW (Zürcher Hochschule für Angewandte Wissenschaften for those of you who read German!) Professor Michael Wüthrich is our instructor, and for our first week he was doing double-duty teaching us and his Swiss students. While leading University of Minnesota students through the first week of a three-week seminar, he was also wrapping up the second semester of the Product Development course. In the IMS (Institute for Mechatronic Systems), each semester of their three-year program requires a hands-on project development course. 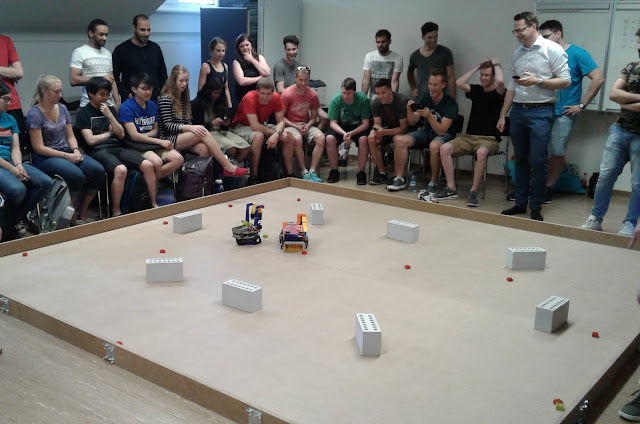 For this particular course (PES2) teams of students had designed, developed, and programmed their own autonomous robot. The end of year competition pits one robot team against another in elimination rounds. Two robots at a time take to the field of battle to search out and collect all the green lego bricks they can grab and store (while avoiding obstacles as well as their competitor). Mixed in with the green bricks are red bricks, and collecting a red brick by accident results in a one point penalty (per brick). Each robot is equipped with servomotors, IR sensors and pixie cams. Students write a C++ program, implementing a state machine to quickly and randomly search the field while avoiding obstacles, collecting as many bricks as possible in the time allotted. This was the final week of the semester for Professor Wüthrich's PES2 students. 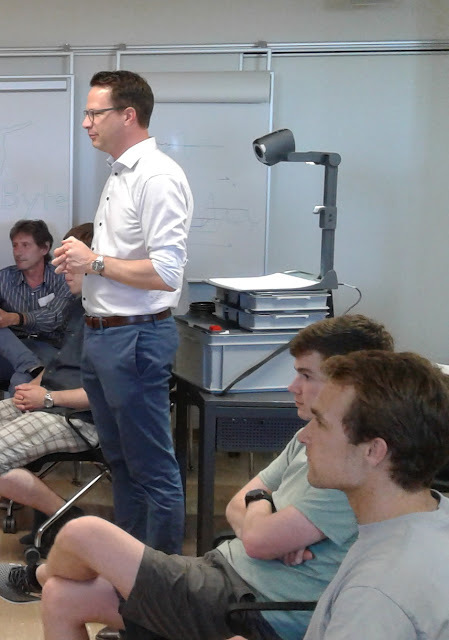 Teams of excited Swiss first years filled the room for this grand finale to their product design course. Our University of Minnesota students watched with interest, because we would be doing (pretty much) the same competition at the conclusion of our three-week stay. After a lot of success, a lot of failure, a few wagers in the back of the room, a lot of robot triage, the two top teams battled it out for top prize, which was awarded to the Rainbow Sparkle Unicorn Team. We immediately adjourned to the courtyard in back for grilled brats and beverages. To see the newspaper coverage of this event (with lots of pictures), check out article in Züriost..